A new world record attempt got underway just after midnight as 70-year-old Vintage Adventurer Rod Wade and his co-driver Michael Flanders drove their 1930 Ford Model A off the sandy beach at Ocean Avenue, Staten Island at 00:01am on Columbus Day (Monday October 14th), heading for Venice Beach, California in under 60 hours. 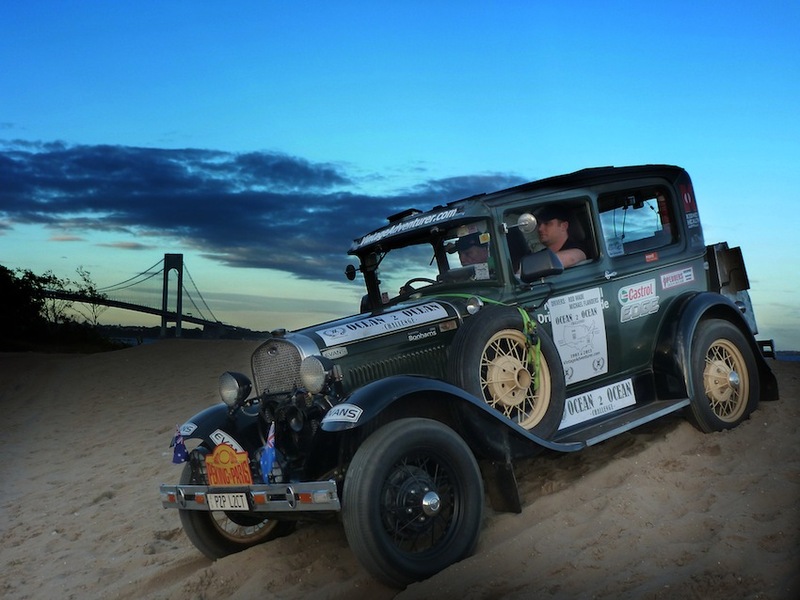 The motoring duo will travel through ten states as they attempt the 2,947mile non-stop drive in under 60 hours. Their planned route will take them along the Lincoln Highway, the pioneering American transcontinental route as well as down sections of iconic Route 66. After leaving Staten Island, the Vintage Adventurer headed for Columbus on the i-70, before moving onto St Louis, Kansas City, Emporia, Wichita, and the Route 66 Park near Oklahoma City. Then it’s highway 40 to Amarillo, Albuquerque, Kingman and Barstow before they start to head through Los Angeles and the finishing point of the Venice Beach fishing pier.